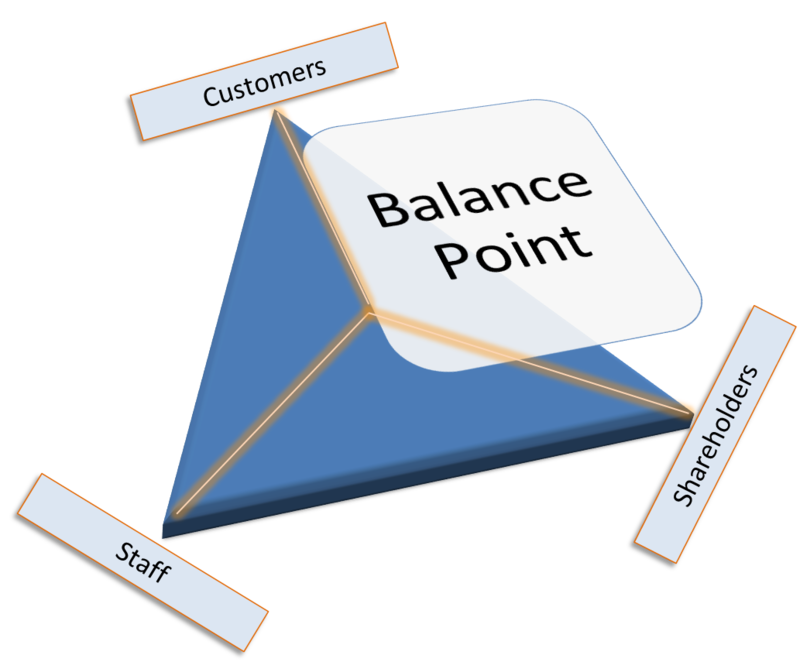 Are you in balance with your business environment, all things considered? A lot of the groups I have subscriptions to have been posing questions about engaging with people, particularly staff, to ensure that the business performs to it’s capacity and capabilities. I have observed that many leaders make one particular mistake. They don’t get their activities balanced right. One of the golden rules of business is not focusing on the part of the business you enjoy doing the most. You should be spending your time, when all things are considered, equally between your staff your customers and your shareholders (read stakeholders for those without pure shareholders!) These are the key focus headings, there are others but these are the three keys! And I am not talking work/life balance that is a whole different space for another day …. Of course I have qualified the statement with a rider that this is an average position everything being equal. That is over time the internal and external landscape pressures imposed on you and the company are also in balance. Clearly if there is an impact in your ecosystem that causes you to focus on one of the the three areas more than the others then so be it. Today I worked with a client on their sales and marketing strategies, clearly the balance shifted to the customer for much of this conversation. So when you get time to reflect on the focus of your business activities it is useful to ask yourself the question – am I on balance in balance? Vision without action or action without vision – are you guilty? 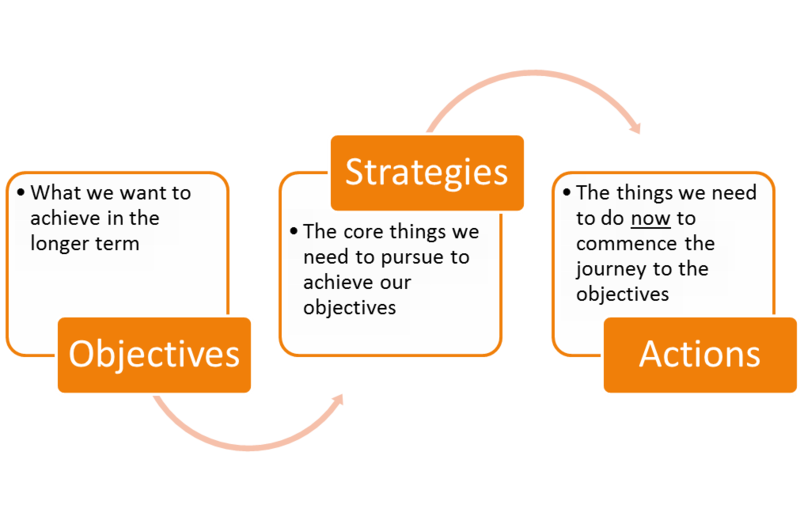 One of the big problems with strategic plans is that they never get executed. The best laid plans and intentions at the strategy workshop, the energy and enthusiasm can quickly abate when the realities of day to day work are imposed on those who have to make the strategy happen. If this is done correctly it avoids the last minute rush to action strategic plans when progress reporting is due! This is what some people call “hockey stick” implementation. And believe me when this approach is adopted you are always playing catch up and rarely if ever have I seen a client catch up. So don’t fall for the trap of having a great vision but little action – that is just dreaming. And worse still don’t take action without vision – that is just activity! I have been helping people plan for many years. One of the fundamental problems is that some who come to the table to plan want to give your their answers, right at the start. A plan, broken down to it’s simplest form has three distinct components. You need to work out where you want to be, by when first. Then develop the strategies setting the path by which you will get there. And finally the actions you need to take in the near term to reach these longer term goals. For example, suppose you are a really good motor racing driver who wants to win a championship in the next three years (your objective). You will need to get a major sponsor, get signed by a top team, find a group of professional supporters (fitness coach for example, mentor), build a fan base (promote yourself and build a community of support) and compete at the highest levels (your strategies). So today you need to write a formal business proposal and develop a budget, set up meetings with potential sponsors and promote your value, engage with top teams to sell your capabilities and learn about their rosters, hire a technologist to build a social network and web presence, etc etc (your actions). If you jump to the actions without going systematically through the process then you have the potential to miss out on some important considerations. When developing plans it is good to get those together who will be integral in the ultimate execution of the plan. The more scenarios you look at the more likely you will find the one most likely to lead to your success. Of course it is a lot more complex than this but it never hurts to go back to first principles and test what you have done. Disruptive Innovation or Technology – does your business have one coming? There are lots of examples of disruptive technologies and or innovations which have changed the shape of a market. I have previously cited the music industry as a classic example of ongoing disruptive innovations. But there are lots more. and I am sure you can think of lots more? The issue is how could you anticipate these changes? Well most of these occured on the back of some major change in the environment such as new technology break throughs or technology changes which allowed a change in customer service delivery. So when you are developing your own strategic plans it is wise to look beyond your current environment and ask a lot of what if questions. The only certainty is that there is a major disruption somewhere on the horizon. The trick is to see if we can see it coming before it is too late for us to catch the wave. In the late 1990’s I was the leader of an elite group responsible for organizational development of an Australian energy utility. Part of the teams mandate was strategic planning including board level and executive plans. selected from within the organization and some key external consultants, the key one being Peter Smiles (now deceased) principal of Peter Smiles and Associates. The team was an incubator of ideas, concepts, pilots and innovative activities. opposite outcome, that is the organization would fall behind and that the longer that strategy was adopted the further behind we would be. 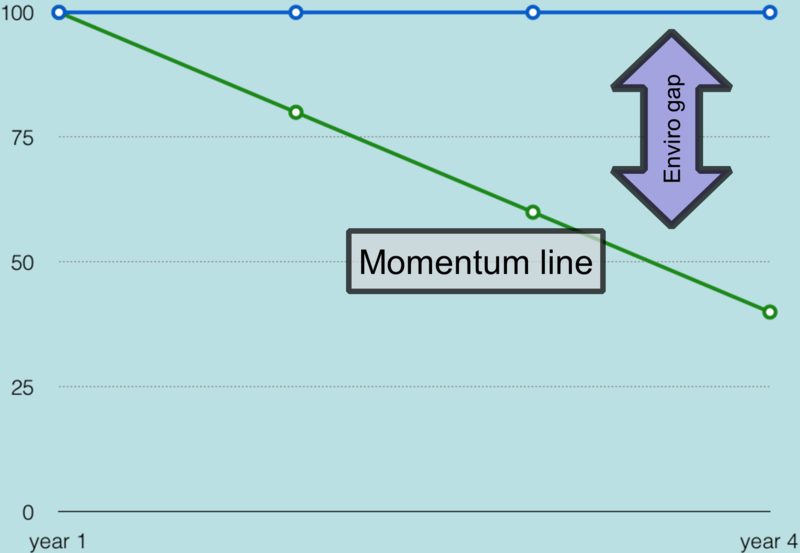 The concept of the momentum line was born. If our performance today was 100% then a status quo approach would mean a continuously falling relative performance, marked against our peers, going forward due to natural environmental pressures. As we analysed the environmental changes that were occurring, that were reasonably foreseeable or that emerged through our “what if” analysis, the evidence was overwhelming. We looked at other markets for utilities that had undergone change and we looked at other industries that had undergone change and saw predictable behaviours. Some 20 years later case studies abound that support the analysis. closure has led to many automotive parts manufacturers having to move into other sectors or to close down. 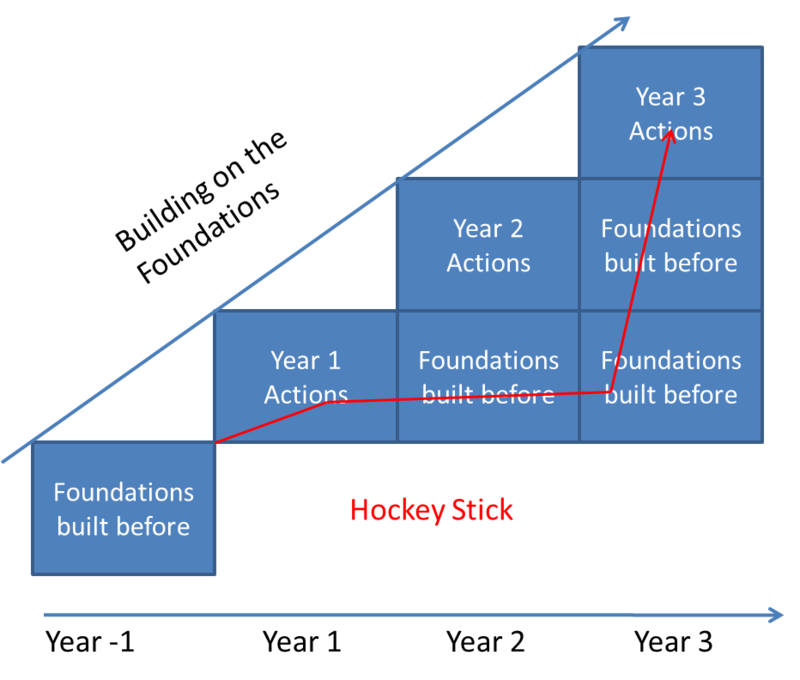 We contended at the time that simple productivity and cost efficiency initiatives could stem the decline at the early stages, ie internally optimizing the organization (strengths and weaknesses) but that to continually close the gap would require innovation and new business models and external optimization (opportunities and threats). Of course to be a truly great company met we had to grow returns rather than the flat line of maintaining the value added to the shareholder. A challenging objective but one that ultimately paid off as the company, whilst a minnow in the sector, became the number three financial performer and number one electricity utility in the annual independent assessment. So companies today can learn from years of predictable patterns. By all means stick to the knitting but whatever you do do not adopt a do nothing approach. It will take a lot more input later to correct a declining organization than it will to get the strategy right now. Use the energy of the company now to adopt actions that continue to build strong foundations over time that allow new innovative offerings, supporting core activities, strong customer relationships and builds new channels. A valuable personal planning tip – do it now! Here is a quick tip on something that I have found over the years to work very effectively. Take a sheet of paper and write down the 10 things you want to achieve in the next 12 months. They don’t have to be work related, but I guess some will be! See there is 10 headings and we haven’t got to workplace yet. For example you might want to attend two music festivals, volunteer to help collect money for a local charity and exhibit your photography at your favorite gallery. Now place the piece of paper in an envelope, seal it up, date it todays date and store it somewhere safe. Place a reminder in your diary to check it in 12 months time. In my experience you will achieve at least 60% of what you wrote and many times people go above this. Write it down, it focuses your subconcious and gets your forming strategies on how to achieve the results. I was once told if I wanted to stand out in a crowd I should pick a dull crowd! Well I always wanted to be part of a top team not the top person in a dud team. Getting noticed is all about getting results, being part of the solution not part of the problem. The most sort after people are those who execute plans. So how do you get to that point? It is easier to get results through collaboration and consensus. When people are on side to your vision and mission it is easier to take them along for the journey, and it is easier to get them onside if you involve them in the development of the strategy. Too many times you see strategy developed with a top down approach. Execution is much harder under this scenario. Focus on the outcome, work out the steps to get there, then start the journey, with and through those who want to be part of the solution. Those who put up barriers and hurdles on this project will see the results and the kudos the results bring and inevitably want to come and play in your sandpit next time they are invited. And hey if they don’t it is not a big issue, just keep going around them and focusing on the outcomes. So if you want to stand out in the crowd, get the crowd on side. Leverage the synergies and get results. Be known as an outcome creator.